This tutorial shows you how to export your presets in order to share them with the community on the Blue Cat Audio website. This tutorial uses Blue Cat's Stereo Triple EQ for the demonstration but is applicable to all our plugins, on both windows and Mac. The idea is to use Blue Cat Audio's cross-platform preset format so that your presets can be read on any platform / plugin format combination. The presets are exported one by one as a file and can then be read on any other platform. We advise you to choose a meaningful file name for each preset as it will be the only way for others to know what the preset does. Now that you have exported your presets in a format that can be read by anybody, you can send them to us by email (support [at] bluecataudio [dot] com). We will verify them and publish them on our website shortly. Do not forget to give us your name as well as a title and a description for your group of presets. 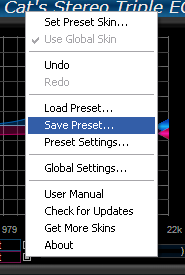 New presets will appear as download links on the product page (check on the right of the page or this tutorial). We invite you to also check existing presets for your favorite Blue Cat Audio products!